IN THE MILL: Continued Restoration. 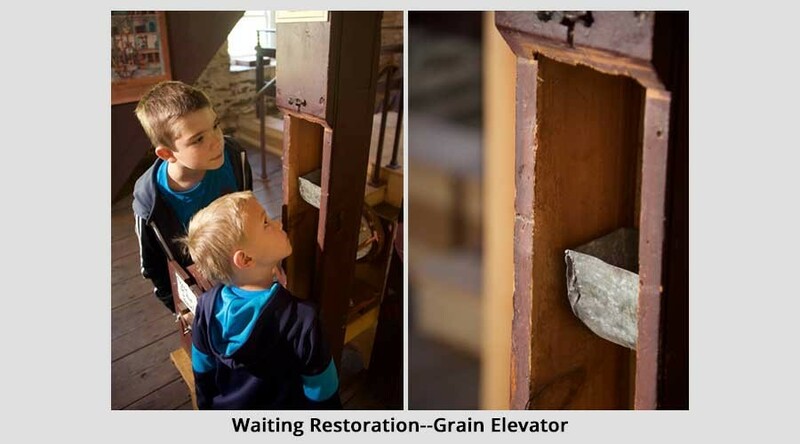 After almost two decades of standing idle, Peirce Mill reopened and began grinding grain in October 2011, the result of a partnership between the Friends of Peirce Mill and the National Park Service. 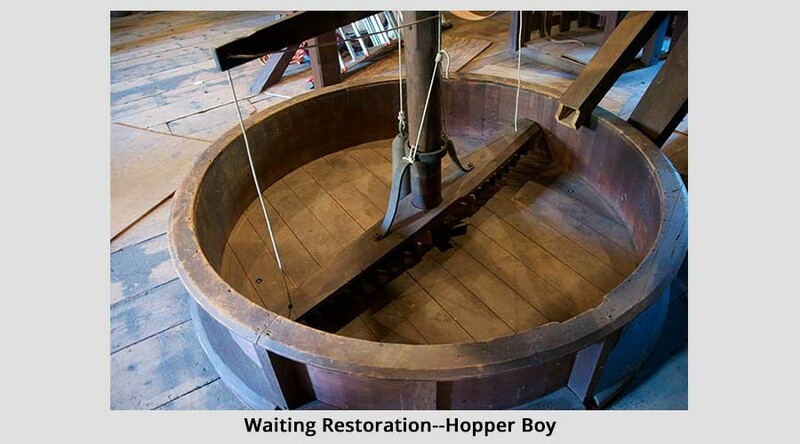 The $3 million restoration included fabrication of a new oak water wheel, repairs to the gears, millstones, and flooring, and the installation of a pump to recirculate the water powering the mill. The restoration also removed the parking lot in front of the mill, making the grounds more historically accurate and providing additional space for interpretive activities. In 2016, repairs brought back into operation the water-powered hoist system that lifted or lowered barrels between floors. With new funding, the Friends plan to restore the complete “Evans System” named after American inventor Oliver Evans. 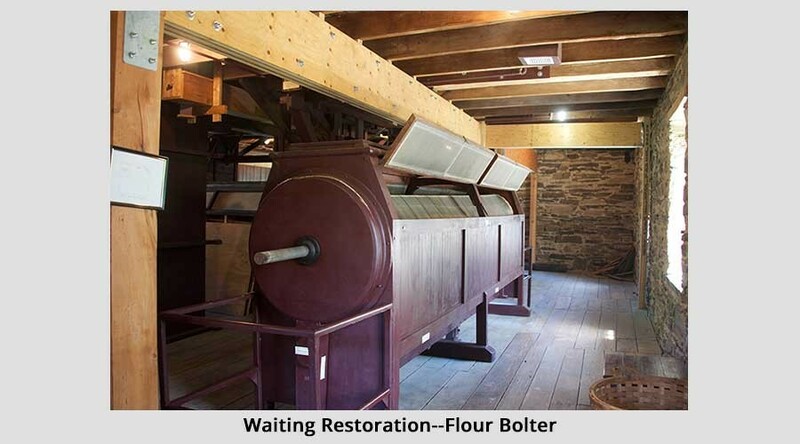 It mechanized all of the operations of the mill — the elevators that moved grain, the “hopper boy” device that cooled the freshly-milled flour, and the various cleaning and sifting components. IN THE MILL: Sale of Peirce Mill Flour. 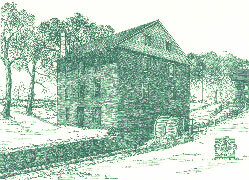 Peirce Mill was Washington DC’s original producer of healthy whole grain flours. Many of today’s visitors mention that they purchased flour at the mill. Wheat, corn and rye ground at the mill was still being sold to the public in the early 1990s – in fact, until the breakdown in 1993. The Friends and the Park Service are currently studying the requirements to revive this tradition. 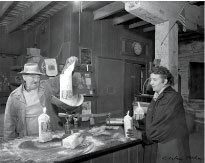 This photo taken inside Peirce Mill in 1957 shows miller Raymond Watt measuring out freshly ground flour for sale to visitors. The desk where he stands was then located on the main floor; the miller’s office can be seen in the background. IN THE VISITOR CENTER: Expanded Programming. The Peirce Mill information center is located near the mill in a small stone building that once served as the Peirce family’s horse and carriage barn. Today, visitors can watch short videos on the mill’s history and bread making, read interpretive posters, and buy souvenirs, books, and other mill-related merchandise. 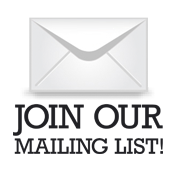 We would like to broaden the use of the information center by demonstrating everyday life at the Peirce Plantation, and hosting talks on such subjects as inventor Oliver Evans, and the role of slavery in Washington DC. We also plan to increase space for hands-on activities for children. IN THE MILL VILLAGE: Create a Community Space. During the 19th century the Peirce Mill “village” – located at an east-west crossroads – was a community gathering spot. Farmers would have spent the time waiting their turn by trading goods, discussing the news of the day or hashing over political opinions. A blacksmith probably operated his shop there, and the Peirce sawmill was used to cut building materials. Our recent planting of a demonstration fruit orchard behind the mill recalls the vast Peirce commercial nursery. It can serve as focal point for tours concerning 19th century fruit husbandry, the role of cider in American culture, and nutrition. The Friends plan to recognize and re-create the role of Peirce Mill as a community center by inviting groups to use the mill area for dances, meetings and other activities. We also plan to promote the mill as a gathering point for hiking, running, biking and community groups who want to explore the park. The Peirce Mill village is a unique educational site. Visitors, including school groups, learn about the history of invention, 19th century American life, as well the principles of gravity, simple machines, and water power. The mill conveys information in a way no museum exhibit can. 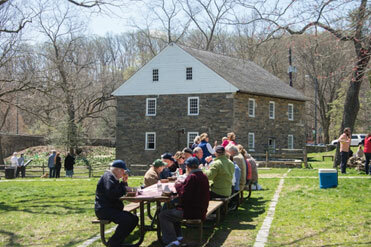 Classes on the basics of historic restoration using Peirce Mill as an example. Increasing the diversity of visitors by offering tours and events in Spanish. Bread making classes, using traditional methods. Re-opening the stone springhouse, a rarity in modern Washington DC. Creation of a video on the mechanical operation of the mill showing how the mill will operate when fully restored.